MONTPELIER, Vt. – The Vermont Fish & Wildlife Department says it still has a few openings at its Green Mountain Conservation Camps this summer and that this is a great opportunity if you are 12 to 14 years old and want to learn about Vermont's wildlife and gain outdoor skills. The one-week camp program is held at two locations -- Lake Bomoseen in Castleton and Buck Lake in Woodbury. 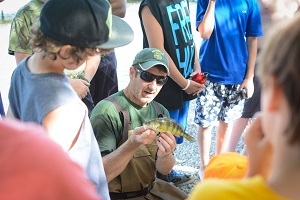 Campers participate in hands-on learning about fish and wildlife conservation, ecology, forestry, orienteering, safe firearm and archery techniques, swimming, canoeing, fishing and more. Natural resource professionals come to the camps to share information on their programs and take campers out for field activities. Conservation Camps open June 17 and continue until August 17. Tuition is $250 for the week, including food, lodging and equipment. 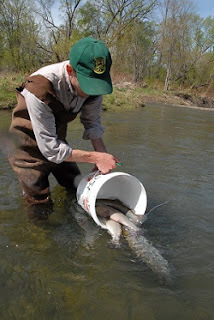 Online applications and information are available at www.vtfishandwildlife.com. For more information about Green Mountain Conservation Camps contact: fwgmcc@vermont.gov or call 802-828-1460. MONTPELIER, Vt. – Vermont’s “Trophy Trout” stocking program for 2018 includes eight river sections and 15 lakes and ponds receiving the two-year old trout, some over 18 inches long. Trout fishing opened April 14, and will continue through October 31 this year in the river sections listed below. There is no length limit. The daily creel limit is two trout. 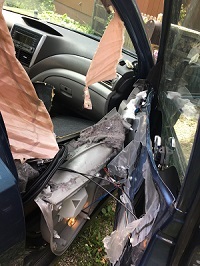 MONTPELIER, Vt – As incidents of bears breaking into homes, garages, sheds and vehicles in Vermont increases, so too should efforts by residents to bear-proof their homes and secure potential outdoor food sources that can attract bears. While searching for food in early July, one bear broke into a Killington home through an open window, and another Killington bear entered the Northstar Lodge through an open door. A Pownal woman awoke to the sound of a bear breaking through a kitchen window to access a honey comb that had been left within reach, while a similar incident occurred in Townsend where a bear broke into a kitchen freezer. According to Vermont State Game Warden Sergeant Chad Barrett, bears don’t naturally break into homes. They must first have had experience receiving food from humans. The process of habituation begins with attractants that residents leave out such as birdseed, pet food, or unsecured garbage. MONTPELIER, Vt. – One of Vermont’s premier wildlife watching opportunities is happening right now. 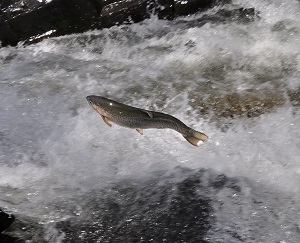 The steelhead rainbow trout have started their upstream migration, leaping up waterfalls in a spectacular display of determination on their way to their spawning grounds. The best place to spot steelhead is at Willoughby Falls just outside Orleans in Vermont’s Northeast Kingdom. Other places to see migrating steelhead include Coventry Falls on the Black River in Coventry and Lewis Creek Falls in North Ferrisburgh, though Willoughby Falls remains the best viewing opportunity.